PC gaming is in crisis. Call it inflation if you like: the numbers go up, but they never come back down. Hit points, damage totals, movement rates – all stacked in their thousands, and getting higher all the time. Case in point: World of Warcraft. As the game’s level limit slowly rises, pulling all the numbers in the game up with it, Blizzard are scrambling to stop Azeroth becoming their Weimar Republic. It’s a crisis of meaning. If I tell you that I have 14,240 hit points, that information bypasses the maths department of your brain and lands comfortably in the Unfathomably Large Numbers inbox, alongside Greek debt and Call of Duty sales figures. In Card Hunter, by contrast, I have 14 hit points. I am acutely aware of this fact, because I’ve already felt the loss of nine of them. I know that my cards allow me six squares of movement this turn, because that’s precisely the number I’ll need to travel to escape the reach of this angry Armoured Dog. Alternatively, I can Slash the beast for 4 damage, potentially enough to finish him off – but risk an ill-fitting canine breastplate reducing the blow’s impact by half, leaving me within ripping distance of his slathering maw. To play Card Hunter is to try and work out the consequences of your actions in advance, in single digits. It’s about making a series of nervous calculations, setting events in motion, and praying your dwarf barbarian won’t watch the events of next round from the side of the board. 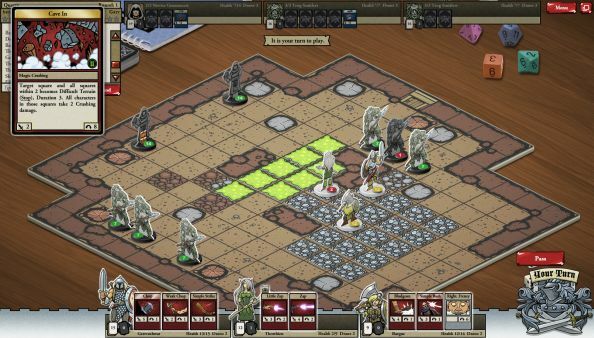 Card Hunter’s a turn-based tactics affair, a bit like XCOM, framed within a fictional tabletop role-playing game. 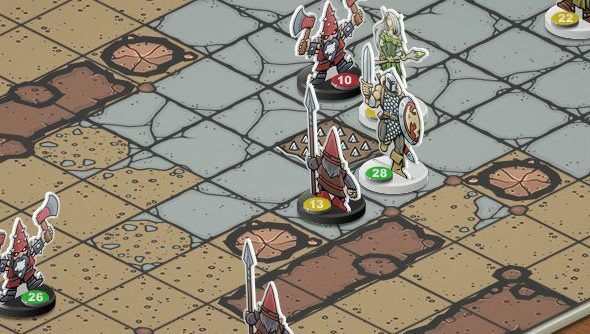 Each turn you’ll make a decision for one of three characters – deploying a card that will grant you four spaces of movement, perhaps, or a slashing attack against an adjacent foe. Ultimately, you’ll want to capture a control point for a certain number of rounds – or more often, simply reduce the hitpoints of all of your opponent’s pieces to zero. It’s also an affectionate ode sung in a friendly tavern to the early days of Dungeons & Dragons. Nominally set in an imaginary realm of troglodytes and elf wizards and whatnot, Card Hunter is actually hosted in the basement of a novice Game Master named Gary. The game’s menus are augmented by half-drunk cans of pop and bowls filled with cheesy puffs, and its matches are punctuated by the the perpetual neckbeard fury of Melvin, seasoned GM and Gary’s older brother (You’ll read his ‘advice’ in the teen-Snoopy drone of The Simpsons’ Comic Book Guy). I don’t know if game designers are yet notoriously bad at parody, but they’ve certainly earned that distinction by now. More often than not, it’s the preserve of the writer who has no confidence in his own fiction – a laboured joke usually played out alongside the very mechanical failings of whatever genre they’ve sought to lampoon. 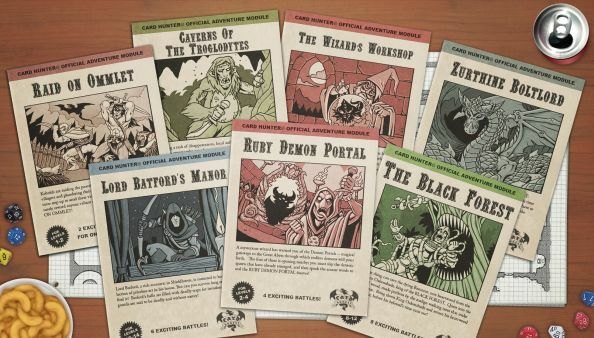 Card Hunter wins where practically every other previous example of the abused art doesn’t for two reasons: it is both better written than the ‘70s D&D modules it skewers and affectionate with it. Every oath is ‘solemn’; every beast ‘fell’. Sometimes, the developers give the dimensions of a battlefield in feet to fuel the imagination. The flavour text used to introduce modules is breezy, mostly contextless and somehow more evocative than most plotted RPGs for it. A quest is never part of a wider conspiracy or world-threatening plan – it’s a wizard’s golems gone wild in his tower, or a ‘malign’ lizard priest defending a den of ‘scaled iniquity’. And then there’s something else: beneath the turn-based tactics and the troglodytes, Card Hunter is also a TCG. That might sound like a complication too many. 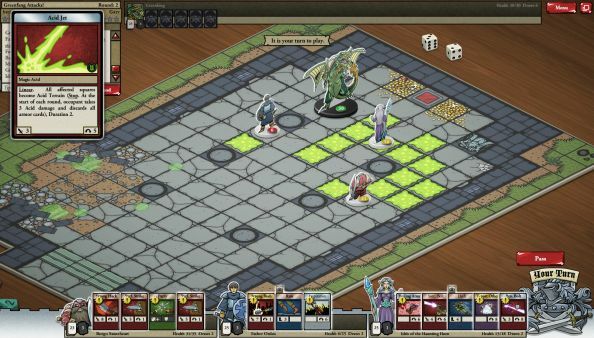 But its real victory is in backgrounding its card system – burying it beneath a clean tactical UI and a paper doll inventory instantly recognisable to anybody who’s played an RPG. The latter is a godsend: the Goldleaf Blade I retrieved from the malign lizard priest I mentioned earlier, for instance, actually represents six cards – three Perfect Strikes, a Parry, an Obliterator Chop and one Large Hack – each a move that might show up in my hand during the next battle. To add those cards to my deck, I just drag and drop the sword into my ‘weapon’ slot and start a new match. It’s funny to remember Blizzard talking up their accessible, semi-automated deck-building features for Hearthstone, impressive though they’ve turned out to be – Card Hunter lets you build a sensible, match-tested deck without even stopping to acknowledge its imaginary cardboard oblongs for what they are. At the beginning of the game, you needn’t spare a thought for your deck makeup; that time’s better spent worrying about the position of your pawns and your next move. In Card Hunter you field three heroes, making one move on their behalf each turn, giving the game the air of a chess or checkers. Death doesn’t wield the same weight as in XCOM, as your characters return to full fitness for the next battle – but the payoff is that you can sacrifice them in the name of some great utilitarian strategy. And you’ll find yourself taking in the same considerations as in Firaxis’ game: the terrain, the cover and wherever it is your opponent happens to be hiding. After a few hours with it, you’ll start to develop your own favourite strategies. When facing lethally lanky trogs, for example, I like to jog about just beyond the reach of their spears. Once they’ve spent their movement cards, I’ll have my wizard plant fire pits beneath their feet (pro tip: the same trick works against our Julian in multiplayer). Victories are airpunch material. Although the dice rolls are there behind many of your moves, every decision made was yours, every step taken a tactical decision infused with intent. And beyond that you’ll be met with a mystery loot chest, and all the excitement of a TCG booster pack. It’s here that the opportunities for payment begin to creep in. One item in every chest, at least as rare as any other in your haul, is enclosed behind glass – out-of-bounds to all but subscription club members. I’ve found the single player game to be smoothly-if-steeply balanced without recourse to club equipment. Thanks to the treasure doled out at the conclusion of each three-battle module and the gold you can earn selling off duplicate shields, you’ll always have access to a slow trickle of level-appropriate gear. That said, chests of randomised high-level equipment are available from an in-game shop, and they’re not particularly extortionate: $5 will get you 150 pizza slices, Card Hunter’s currency, equal to five ‘magnificent’ or one ‘Epic’ chest – the most expensive kind. Multiplayer requires a max level team you won’t acquire before logging plenty of hours in single player, so you’ll likely need to stump up for a starter party – at 50 pizza slices a pop – to participate. Once kitted-out, however, you’re in for a dependably balanced, lunchbreak-length back-and-forth – exactly the kind XCOM failed to provide us with last year. One word of warning, however: single player and multiplayer inventories are shared, so prepare to find your aspiring adventurers’ kit drowned in high-level starter multiplayer equipment. Card Hunter runs in your browser, which is a lovely thing, and there’s a functional full screen option for those who prefer their games to envelop them. However, I do wonder if the format, in conjunction with the easy full stops Blue Manchu have punctuated their game with, have made it just a tad too natural to go off and do something else between matches. The fact that Card Hunter is just one of many open tabs means it’s competing with Twitter, YouTube and my own fickleness for attention, and makes it feel somehow inconsequential. In reality, Card Hunter is anything but inconsequential. It’s a top tier turn-based tactics game, a secret TCG, and the first RPG I’ve ever played to make a virtue of a generic fantasy setting. It’s the inspired XCOM variant that Space Hulk seems to have turned out not to be. Like a lot of what we cover on this site, it’s a game of numbers – but gosh, what a pleasure it is to have those numbers really mean something.